The Robobrew is an electric all-in-one eBIAB system. It allows you to brew the complexity of all-grain batches with the simplicity of electric heat/control in a single vessel system. There is a wide variety of these systems out on the market to choose from. Robobrew aims to be in the midst of these as far as features and function, but at a much lower price to attempt to get this tool in the hands of as many homebrewers as possible. The Robobrew comes in 2 models- one with a built-in pump, and one without. The model without the pump retails for about $350, and the one with a pump for $480. Although a significant price jump, the $480 price tag is several hundred cheaper than its competition. Getting a unit with a pump allows you to take advantage of a lot of the process efficiencies from the eBIAB systems, with convenience of recirculation during mash and pressure-fed wort transfer into your fermenter. The pump is built into the bottom of the unit, tucked away out of sight and out of the way. There is a stainless steel transfer pipe that takes output flow from the pump and sends it up top where it can be directed to where you want it to go. The pump inlet is through an opening in the bottom of the brew chamber. Also in the bottom is the wort temperature sensor and the two independently switched heating elements (1000W + 500W). Although the heating elements have their own manual on/off switch, the unit’s electric controller also has the ability to shut off and turn on power depending on measured mash temperature compared to your set temperature. Importantly, the controller is smart enough to know when it should be using one or both elements when it’s getting close to your set temperature. It also is smart enough to only switch on the 500W element while trying to hold a steady temperature and things start to drift a bit. For mashing, you put your crushed grains into the stainless steel malt pipe, which has a false bottom mesh on the bottom of it to keep grains from getting circulated into the pump or scorched to the bottom. There’s also a second false ‘bottom’ screen, which slides down inside the malt pipe after you’ve filled it with your crushed grains. And if two false bottoms aren’t enough for you, Robobrew has you covered with a third false bottom that sits below the malt pipe, giving you another layer of defense against stray grain particles during the mash, but also importantly keeps hop residue from clogging up your pump or wort chiller. The controller provides basic control function by allowing you to set a target temperature with simple + / – buttons and then letting the controller turn on the elements automatically to heat up and then switch off when the target temperature is reached. There is also a delay feature that allows you to program in a delayed start for when you want the target set temperature to kick in. Set it to something short like a few minutes and make a pseudo mash temperature step profile you program one step at a time. Or for longer times (up to 24 hours) if you want to fill it with water and have the unit turn on to be ready for you after work. Brewing a couple of batches in the Robobrew helped me get a feel for how to work with it. For certain, it was straightforward to use, and mechanically sound with good controller function. However, it did require some compensations on my part. 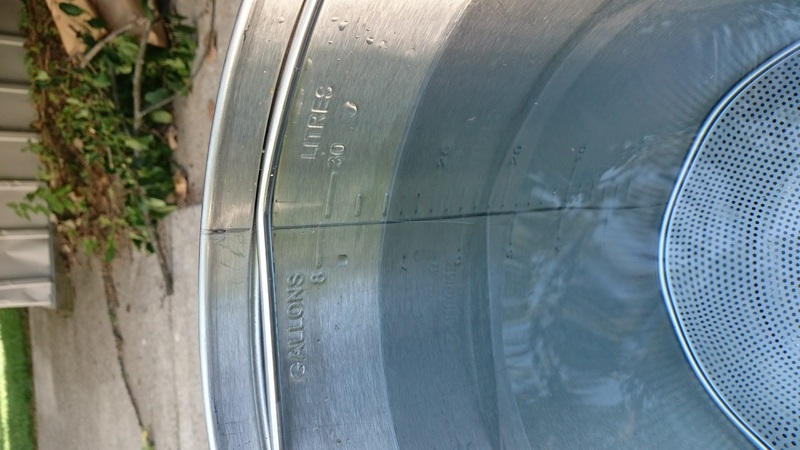 I noticed on my first brew day that as I poured 7 gallons of distilled water into it from seven 1-gallon jugs, that the embossed volume markings showed 7.3 gallons. That was a bit disappointing, but I just learned to compensate by noting the volume markings and doing the 0.3 gallon math. Contacting the folks at Keg King about this, they noted they had already discovered this issue with some units and had made adjustments with the welding set-up to ensure when the sides of the unit get welded to the base, they line up at the appropriate spot for the volume markers. The other adjustment I had to make was in the temperature reading. The digital controller read out a temperature on the display that you might assume is the temperature of your mash. 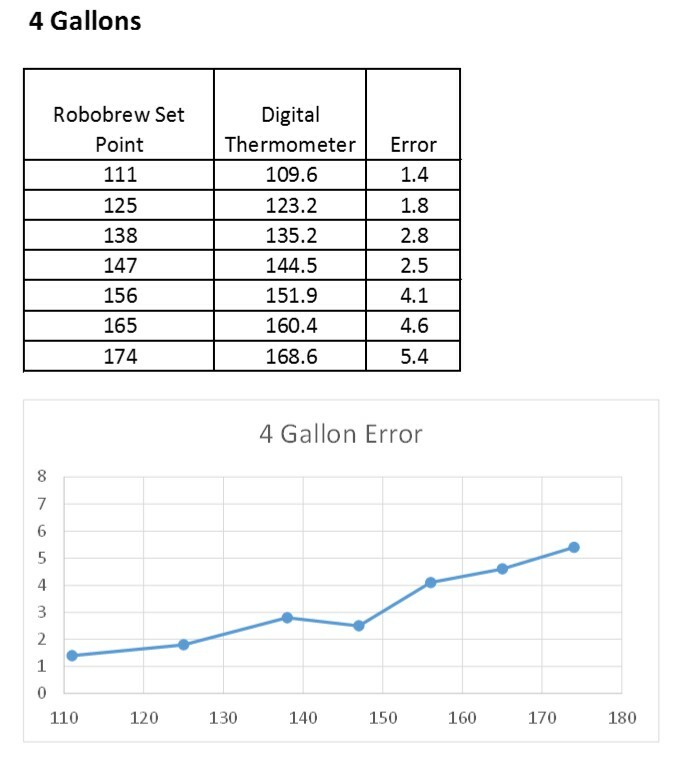 But a check with my calibrated thermometer showed the Robobrew was reading about 5-7 degrees hotter than what I measured in the bulk of the fluid. I had some discussion with Keg King about this and basically it comes down to sensor location (on the bottom of the brew vessel, where the heating elements are) and what they were really trying to accomplish with the sensor. Specifically, they wanted to ensure they were reading the hottest part of the mash so as to avoid unintentional scorching down by the elements. In the end, I’m not sure this gets accomplished, because I just did the math and set a higher target temperature. If I wanted the strike water to be 155 degrees, I knew to set the controller to 155 + 5 = 160 degrees. With this adjustment in mind, I would manually set the controller temperature to a setting using my offset and then monitor with my manual thermometer. The false bottom that’s left in the vessel after you remove the malt pipe really did work awesome as a hop filter for the pump. Even while brewing a hop-heavy IPA, I didn’t have any issues clogging things up in the pump. 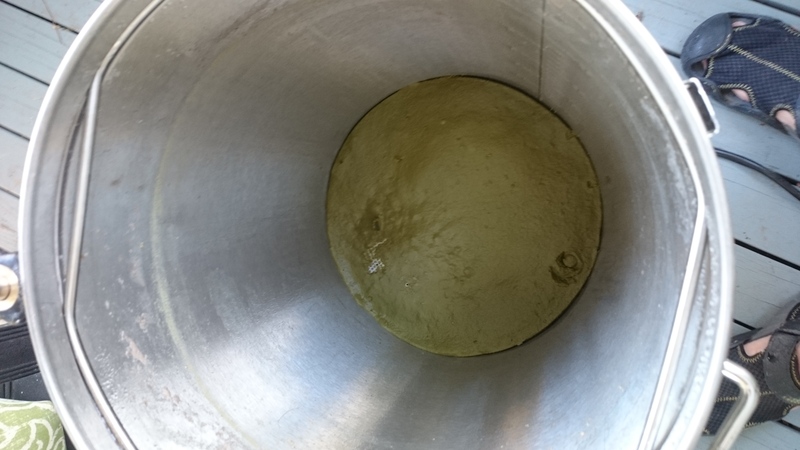 And the thick green layer of hop residue on the bottom after I had drained and transferred everything to the fermenter made it clear why that was. The built-in pump was handy to have for pumping wort through my counterflow chiller and then into the fermenter. 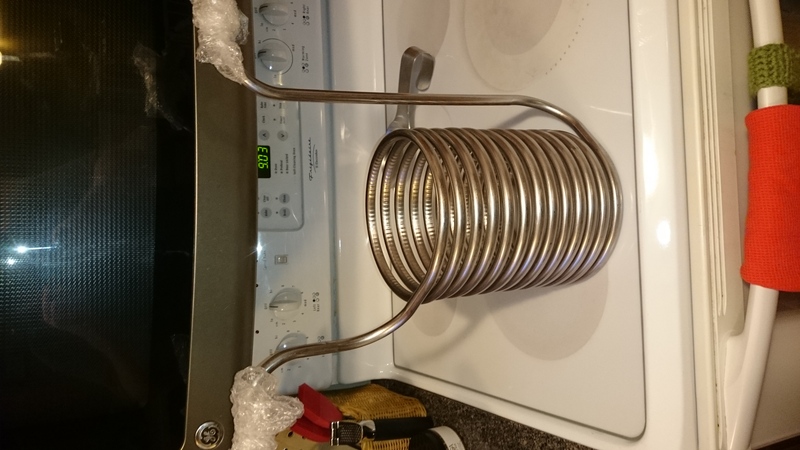 Although the Robobrew comes with a standard coil immersion chiller (in shiny stainless steel), it doesn’t come with all of the necessary fittings and hoses to make it ready to go out of the box. That was fine by me because I didn’t have need of or want to use a coil immersion chiller. As with all of these electric all-in-one eBIAB systems, clean-up was easy and nice having just the single vessel. 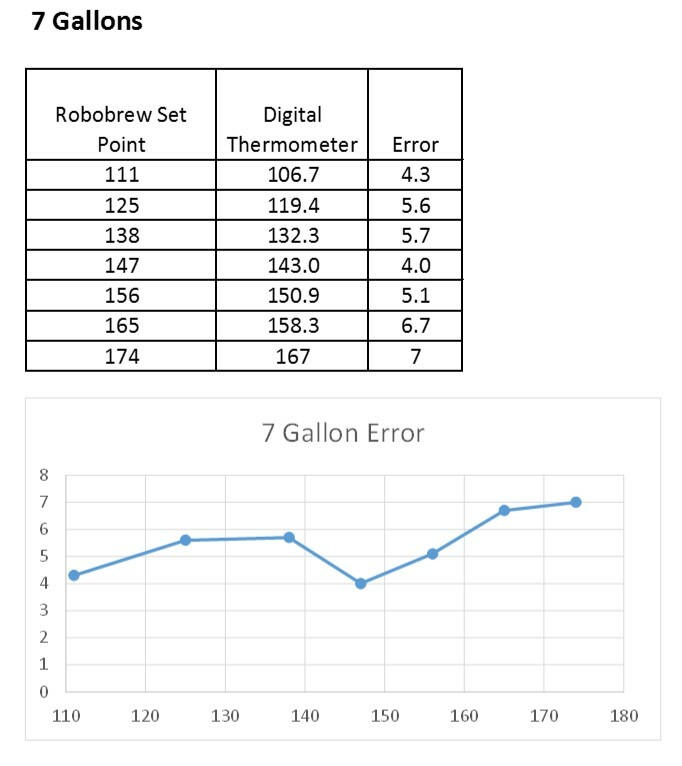 Wanting to better understand the temperature offset, I set up a couple of experiments where I compared the temperature reported by the Robobrew to that which I measured with my calibrated digital thermometer. I did 2 trials with water, one at a smaller volume (4 gallons) and one at a larger volume (7 gallons). These 2 volumes represented roughly what I’d use for a 2.5 gallon batch and a 5 gallon batch. You can see from the plots that both of them have a difference between what the temperature sensor is reading from the bottom of the vessel to what I was reading with my thermometer in the middle of the fluid. The difference was greater with the 7 gallon test than what I saw with the 4 gallon test. I also did a test where I took the 7 gallon volume and set it to hold a steady 152 F for a longer period of time. While I saw the same basic temperature error trend, the controller would switch on to try to control to the 152F, and as a result it held a constant temperature to within a degree during my 30-minute test. My takeaway from these experiments was that I would need to factor in an offset when programming target temperatures. The temperature sensor error was smallest in the area of typical saccharification rest temperatures (~152 F), which was good. As other rest temperatures are perhaps a bit more flexible if I were to use just this 152 F temperature adjustment and apply it to any other mash step set points. Keeping the pump running to recirculate did a good job of keeping temperature steady and the controller was smart enough to just selectively turn on the 500W burner when needed if the temperature started to drop. This helped keep it from doing drastic swings. 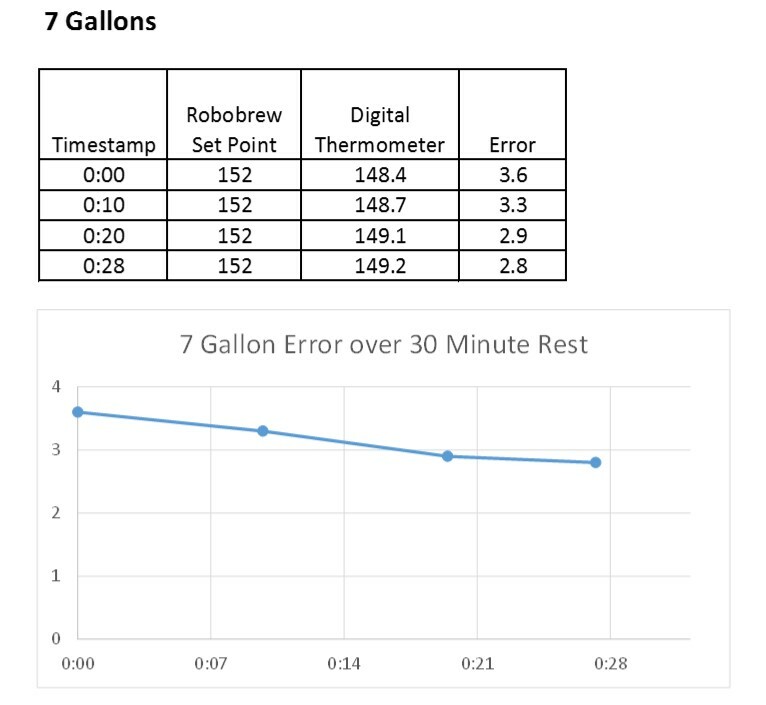 Armed with this data and a better understanding of the system capability, I feel my next brew session will go much smoother knowing how to adjust my target temperature and the ability for the unit to hold temperature well. The Robobrew hit the mark for providing all the same functionality as its competition. It has some advantages like the second false bottom to prevent pump clogging and the delayed start timer, and comes in at a very affordable price compared to its main competition. There are some compensations you have to make with volume markings (if you get a unit like mine) and temperature set points. And although it has an overall good quality appearance, there are spots where you notice the thinner metal gauge in things like weld spots, trim edges, and part handling susceptibility to damage. But altogether, these items are relatively minor, and at the price of $480 compared to $890 for a similarly-equipped Grainfather model, it quite simply puts electric brewing within reach of a lot more folks. And that’s a good thing. This entry was posted in Brew Stands, Brew Systems, Electric Brewing, Featured Reviews, Great Deals, Reviews, Reviews & Top Posts on October 18, 2017 by admin. How long does your brew day take? You really have to define “start” and “finish”. But when I was comparing different systems, I compared start of heating the strike water to the end of boil. My times for that range from as short as just over 3 hours (doing 2.5 gallon batch into the fermentor, with a single temperature rest mash, and a 60 minute boil) to up to 6 hours (doing 5 gal into fermentor, 4 temperature rest mash, and a 90 minute boil). I’d love to get more insight into how you use your counterflow chiller on the robobrew. I’m looking into one to speed up the cooling process. Do you whirlpool hops at the end of boil? The nice thing about the immersion chiller is I can turn it on to decrease the temp and then add whirlpool hops. wondering if there’s a way to do that with the counterflow chiller. Do you just add the wort exit back into the robobrew? I hook up a hose & pump to the outlet spigot at the bottom of the Robobrew and then connect that to my counterflow chiller. In some cases I’ve done the same thing with the built-in pump and taken the output from the recirc pipe to go into the counterflow chiller. Really the main reason I typically use a separate pump is because I’ve got a nice Blichmann RipTide that’s got great flow capacity and is easy to clean. But it’s not necessary. I take the output from the counterflow chiller and just send it back into the Robobrew. I run like this for about 10 minutes without turning on the cooling water so I can use the hot post-boil wort for sanitizing the counterflow chiller. When I’m satisfied with that, I turn on the cooling water and watch the temp drop like a rock. When I was using the Grainfather, I definitely ran into pump inlet clogging trying to use the on-board pump and recirculate into the counterflow chiller. I’ve got a buddy that brews with the Grainfather and gets around the clogging by doing a good whirlpool stir before turning on the pump. The Robobrew has another false bottom that helps keep hop debris from clogging the pump, so I don’t ever bother with whirlpool. And from a hopping standpoint, my limited trials with hops at flameout made awesome hop character in my beer but it only lasted about 2 weeks before vanishing completely. So I don’t bother with whirlpool hopping. How long was your brewday with this system? It seems like a great value, but I’m concerned I’d be better off spending a bit more. I’m fighting with myself over using a lower wattage system that can be a bit more portable and keeping brew times down. I reviewed a number of systems about 2 years ago, some 240V and some 120V. It’s hard to do a completely pure comparison because I brewed various recipes across these different systems. But in reviewing the data, the 240V systems took about 3.5 – 4 hours measured from starting to heat the water to boil being done. The 120V systems took about 5-5.5 hours. So no doubt there’s a real time difference there. But when I looked at various times for the same start to heat strike water to boil done metric on my 3-vessel process/system with LP burner, I was almost at 5.5 hours. Now comparing 3-vessel propane to 120V eBIAB the time numbers are deceptive. That propane system took a lot more babysitting to ensure temperatures were reached properly, making sure I didn’t run out of propane, and making sure I didn’t burn the house down by leaving a burning flame unattended. The the electric systems with these controllers, you truly do free up time to do other stuff. This could be feeding the kids lunch, doing email on your computer, or grinding your grains without fear of overshooting strike temperature. Or prepping your fermentor for when you’re done. So although 240V is faster than 120V, 120V electric brewing consumes less time than propane-fired systems because you can rely on the controller. Another consideration with the Robobrew and some other 120V systems is the timer function. So you can take the 40 minutes needed to heat strike water and let that happen while you’re at work or while you’re still in bed. So that shaves off more of your brew day time. And at the end of the day, all of the BIAB systems use less stuff and that requires less cleaning and hauling of gear up & down the stairs. Also shortening total brew day. Lastly 240V will constrain where you can brew. This might not be a big deal to you, but from time to time it’s nice to sit out on the back deck and enjoy the weather while brewing. You might not have a 240V outlet out there. Or going over to a buddy’s place to brew together also means probably not having a 240V outlet available to you. Brad – Excellent review. Thanks for taking the time to explore this topic and for your insights. 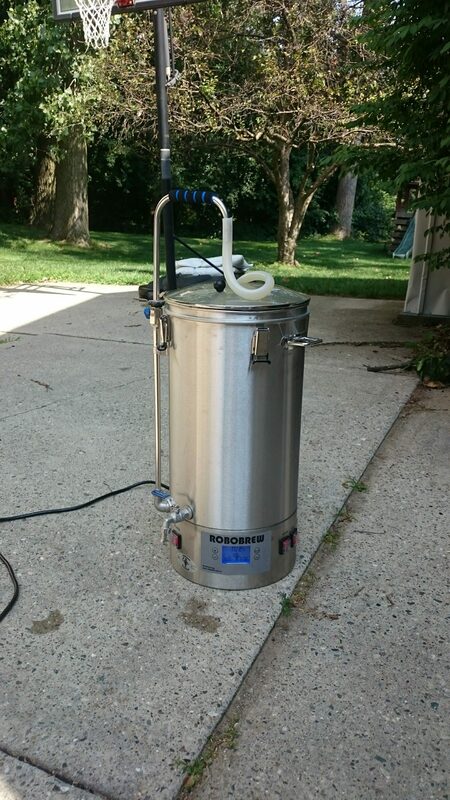 I’m convinced – Robobrew with pump is the best route to start all grain adventure. Good question, and I’ve got a complicated answer. I won’t propose to have it definitively sorted out yet after only a couple brews, but here are my thoughts on this. It all revolves around the temperature sensing/control. 1. Robobrew has the temperature sensor placed & calibrated to read the mash temperature next to the heating elements at the bottom. So if you’re setting your mash temperature based on the wort temperature in the middle of your vessel, your digital readout and controller will be reading high. 2. Conceptually the recirculation flow should help mix the fluid better throughout, but it is also fighting against heat loss of the wort as it travels up the recirculation pipe. I found that the cool-off effect of this was significant when measuring with my own thermometer and instead of my bulk temperature going up because I was scooping hot wort from the bottom and dumping it up top, I actually got the bulk temperature going down as I recirculated. To me, this says I’m losing more heat through the recirc pipe than I’m seeing in temperature differential between the center of the mash and the bottom of the vessel. But there may be other explanations. 3. The concept of recirculating to keep everything even and on temperature runs into issues because of the difference between what the controller is controlling to (temperature at bottom of vessel) versus what I want to control to (temperature in middle of mash). So if you recirc and successfully redistribute heat, your heating element won’t kick on until a point where the temperature in the middle of your mash is much lower than you want. Based on the above 3 points, here’s how I concluded was the best way (for me) to approach it. Set the controller target temperature 7 degrees hotter than I want the mash to be. Once it reaches temperature and the elements kick off, stir it up with a mash spoon to get good fluid distribution and then measure the temperature. If I’m good, wrap the whole unit in an insulating layer (I use an old down-filled winter coat) and be sure to cover the open hole in the lid (which I overlooked on first attempt) and let it just rest/mash. If it’s too hot, run the recirc pump while monitoring the temperature with my own thermometer until it reaches target temp and then turn it off and wrap in insulation. I’m concerned that if I constantly ran the pump during the mash, I’d be constantly cooling things off through the transfer pipe, and I wouldn’t get the heating element to kick on at the right point because it was worried about the temperature of the wort at the bottom next to the elements that were still cooling down, and as a result I’d get big swings in my mash temperature. Wouldn’t the pump just be on the entire time during the mash? I was kind of hoping that this would be the case and would help stabilize temps. A good review especially on temperature control. Too bad a second sensor is not engineered into the system to help mitigate this. However, I have a 5 gallon sculpture system that by comparison makes the temperature issue you determined to be minor. So in effect ROBO would be an improvement. Something to think about when doing a comparison. I am concerned mainly about pump/pipe clogging and overall system cleaning. As I’m sure these two issues may become confounded over time given the potential for internal surfaces to change. What is your review on system cleaning and related issues? Cleaning was pretty easy. Now I didn’t disassemble it to look to see how good of a job I did, but I made sure to clean things right away after I finished brewing and not let things sit and dry on. And with that, I just cleaned the inside of the kettle with a sponge and hot water and rinsed the inside until I didn’t have residue. Then I filled it with a couple gallons of hot tap water and ran it through my counterflow chiller to clean out the chiller and the kettle. Now one downside could be that the pump is inside the unit and you can’t easily pull it out to clean/check it. 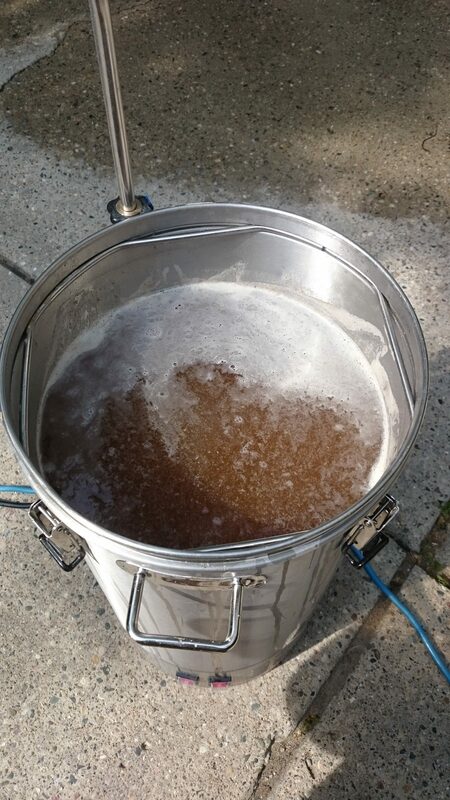 But being that it’s not a fermentor, it doesn’t need to be fully sanitized, just free of unwanted debris. And after pumping a couple gallons of hot water through it, I definitely didn’t have any more debris flowing out.